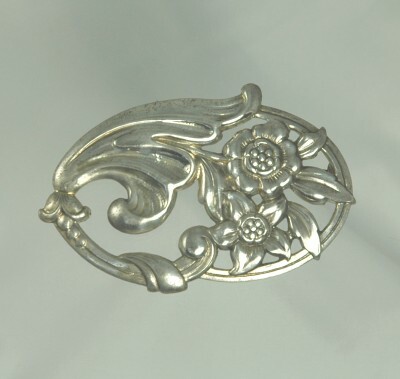 SOLD This circa 1943 sterling brooch is in the Nouveau style with lots or curves and swirls. The attention paid to the floral detailing is amazing. This superlative brooch is signed on the back "Norseland by Coro" with the Viking ship and "Sterling" along with "REG.U.S. PAT.OFF". Patent issued to A. Katz. Condition: Excellent. The sterling has wonderful patina. Measurements: 1 1/2" long and 2 1/2" wide.